Adventure Park at West Bloomfield "Zips Into Spring" for 2017 Season, Opening on April 14 – "Bring On the Fun In the Trees!" 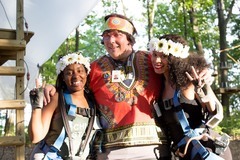 (PRLEAP.COM) April 11, 2017 - The Adventure Park at West Bloomfield, Michigan, the popular outdoor zip line and climbing venue located at 6600 West Maple Road, West Bloomfield Township, will open for its 2017 season of zip line and climbing fun on Friday, April 14 at 3:00 PM for its spring schedule. Hours of operation and other details on the entire 2017 season can be found at the Park's website: WestBloomfieldTrees.org. For details and more special events see the Park website Special Events page. "We are well staffed and excited for our fourth season in West Bloomfield," said Park Manger, Thomas Knuth, adding, "With the mild winter our staff has gotten a head start on prepping the park and grounds for our spring opener. 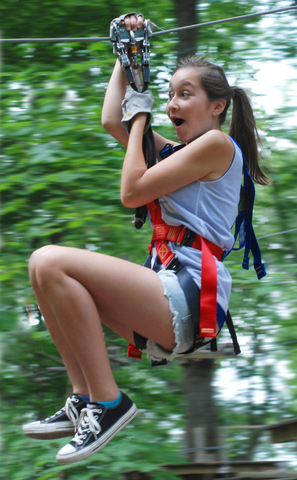 Bring on the fun in the trees!" This year the Park will continue to offer its popular online climbing reservations at the Park website which the public has found very convenient. Reservations can always be changed online right up until the previously booked time. Reservations help avoid waiting by establishing a reserved start time for each climber. The Adventure Park is not one single aerial treetop trail but a variety of different, color-coded aerial trails of differing challenge levels—beginner through expert—that climbers choose from depending on their age or climbing experience. These trails consist of platforms installed in the trees and connected by various configurations of cable, wood and rope to form "crossings" of different kinds including the ever-popular zip lines. Climbers wear harnesses which are doubly secured to safety cables using the Park's "always locked on" system of interlocking safety clips. Before venturing onto the trails climbers receive an interactive orientation and practice session. 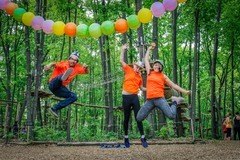 The Adventure Park at West Bloomfield is designed, built and operated by Outdoor Ventures. See hours and prices here. For further details and updates please visit WestBloomfieldTrees.org, email Info@WestBloomfieldTrees.org or call (248) 419-1550.